Our annual exhibition for 2018, showing an array of members’ work, is now showing. 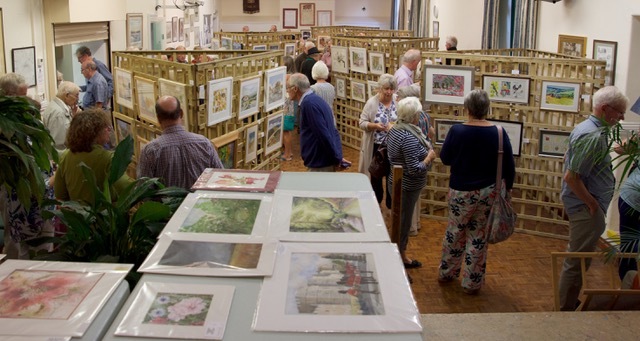 Held in the Parish Rooms in the Market Place in Somerton, it showcases a wide variety of subject and media. Artwork is for sale and we also have a public vote for favourite pieces. The exhibition is open every day until Saturday 18th August. From 10am until 6pm weekdays and from 10am until 2pm on Saturday. The Preview was held on Monday 13th August and we hosted an increase in visitors, and sales of artwork began. Members and non-members alike enjoyed canapés and wine as they chatted and perused the many paintings on display.